In this novel the depth of anti-Chinese feeling among many of San Franciscos citizens is brought to light. Most Chinese were compelled to live in a segregated quarter while they worked to pay off moneys owed in contracts they had signed onto for their passage. Branded by anti-Chinese groups as barbaric interlopers who threatened to take jobs away from white laborers, they faced riots resulting in the trashing and burning of their shops. Chinese women in particular led perilous life. Relegated to lives of servitude, they often were placed in demeaning brothels. Cecilia Davies, a trained nurse who once served in the Crimea, finds herself in the middle of these conflicts. After her bounder of a husband disappeared, seemingly for good, she opened a free medical clinic for women who have nowhere to turn. With a half Chinese cousin she has pledged to raise, and with contacts within the Chinese community, her inquiries into the murder of a Chinese woman she knew put both herself and her cousin in danger. Descriptions of the area that is now downtown San Francisco include insights into the so called "Barbary Coasts" violent smuggling rings and the rampant corruption of the citys officials. The authors description of the constraining clothes women wore, corsets included, is illuminating as well. Other constraints are the difficulties Cecilia daily faces in her work as a female in medicine and, now, investigator into crimes against her friends. In her brief Author Note, Herriman mentions her reliance on first person accounts. These are wonderful, but the many history books which cover this period in San Franciscos history seem to have been ignored. 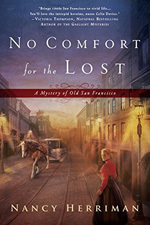 Reviews on this site of other 1850s to 1895 mysteries set in SF include: Woman of Ill Fame by Erika Mailman, Murder on Nob Hill, by Shirley Tallman, The Spook Lights Affair by Marcia Muller and Bill Pronzini.